The global juice concentrate market has been anticipated in a publication by Transparency Market Research (TMR) to be significantly fragmented and competitive. There could be a handful of players gaining an edge over other contestants in the market in terms of product differentiation. Players have been predicted to give a tough competition in the industry as they strive to come up with new products that flaunt novel flavors and tastes. Ciatti Company, SkyPeople Fruit Juice Inc., Ingredion Incorporated, Dohler Company, and Archer Daniels Midland Co. are some of the leading names of the market. The publication has provided a detailed view of how the competitive landscape could shape in the near future. TMR has envisaged the global juice concentrate market to secure a staggering revenue of US$117.89 bn by the completion of 2025 after advancing from an US$89.56 bn valuation attained in 2016. Between 2017 and 2025, the market could post a 3.4% CAGR. On the basis of type, the market could see a continuation of the lead achieved by fruit juice concentrate in 2016. By region, Europe has been foreseen to attain supremacy in the market, considering its dominating reach to a US$32.97 bn in 2017. Busy lifestyles and changing food habits of people have caused a surge in the attractiveness of convenience foods and beverages. While this could stoke the growth of the world juice concentrate market, there could be a positive influence placed on the demand for various products due to the trending adoption of a healthy way of life. The demand for fruit and vegetable juice concentrates has been expected to see a rise on account of the increasing awareness about healthy living. As more number of people adopt health-benefiting foods owing to a rising consciousness about good health, the demand could continue to increase in the coming years. Fruit juice concentrate is used in several foods and beverages such as ice creams and curds. If the form of juice concentrate is taken into consideration, clear concentrate has been foretold to gain a larger market share in the near future. Excess consumption of fructose has been scientifically studied to have harmful effects on the body. In this regard, it has been expected of juice concentrates containing a high amount of fructose to see a decline in their demand. However, as per a study provided in the publication, the demand for juice concentrate could rise while riding on strong expenditure on non-alcoholic and alcoholic fruit drink products due to changing economic conditions around the world. Moreover, there has been an increased spending on baby food, yogurt, and ice cream. Furthermore, there are companies that introduce new flavors in the international juice concentrate market catering to the middle-income group. They have also been keen on introducing products that boast of high nutritional values. 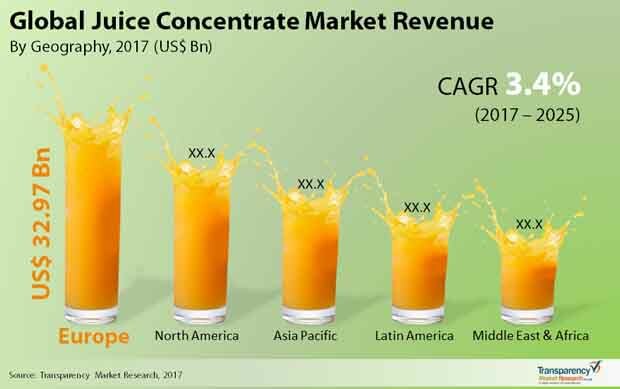 Cost-effectiveness and longer shelf life of juice concentrates compared to fresh juices could be other factors augmenting the demand in the market. Wide usage in several foods and beverages helps fruit juice concentrates to gain an upper hand over vegetable juice concentrates. Large companies make investments to bring new flavors to the market that are high in nutrition and cater to the middle-income group.